Abortion in America goes back to the founding of the country in the 1770s. Throughout the 19th century, abortions were performed mostly unregulated – some jurisdictions attempted to limit and discourage the practice – and the number of injuries and deaths weren’t officially recorded. By the turn of the 20th century, abortion was considered a criminal offense. 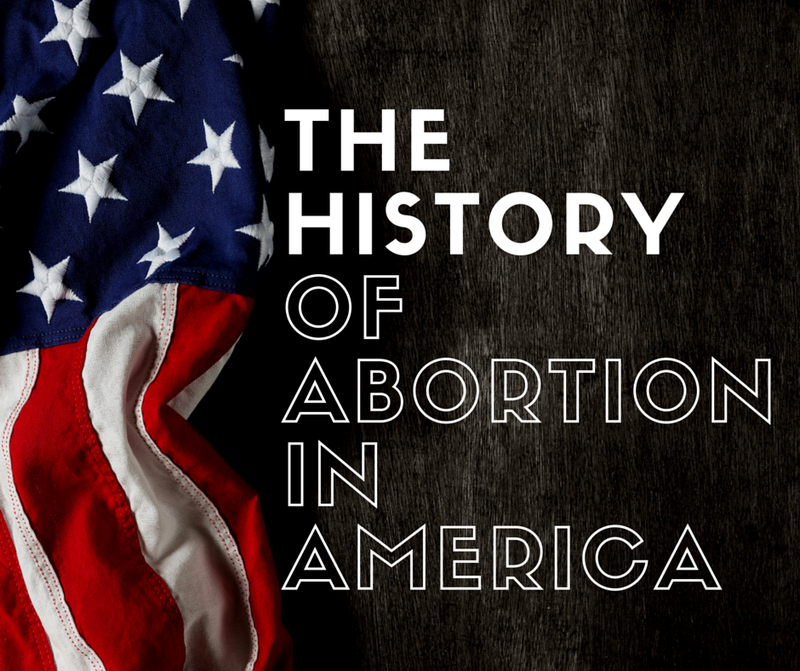 This blog will highlight key milestones of the messy, sometimes fatal and always controversial history of abortion in the United States of America. It’s hard to believe, but the earliest anti-abortion measures were taken in the first few decades of the 1800s. In Connecticut, legislation was signed in 1821 to prevent the use of poison for abortions. Back in those days, poison was administered by some women up to their fourth month of pregnancy. Thirty-five years later, the nation’s first vocal pro-life advocates, led by Dr. Horatio Storer, began work to end legal abortion in the United States. This was just six years before the American Civil War (1861-1865) began. Social activist and feminist Susan B. Anthony famously decried abortion in her 1875 “Social Purity” speech, a far cry from the current feminist viewpoint. In 1890, the American Medical Association (AMA) proclaimed that abortion should be regulated and, if the life of the mother was in jeopardy, abortion was permitted. The 20th century started with abortion as illegal in the USA, but change was on the horizon. The Roaring 20s saw major upheavals in America, including women’s health issues. Margaret Sanger’s influential political campaigns helped launch the modern birth control movement, which would have a profound impact on the legality of abortion. The Second World War and its aftermath dominated headlines (and the public’s attention) from the end of the 1930s through the 1940s, but the strong undercurrent of public opinion was moving on abortion. Similar to the 1920s, the 1960s were equally tumultuous in terms of the abortion debate. In 1963, the Society for Human Abortion was founded in California. This organization provided information on abortion and contraceptives, which challenged current law. Four years later, Colorado became the first state to significantly change its abortion laws, opening the door for California’s landmark 1969 court case, which said women have the right to choose abortion. In 1970, four states (Hawaii, New York, Alaska and Washington) struck down abortion bans, making abortion legally available for women for up to 24 weeks into pregnancy. The monumental Roe vs Wade U.S. Supreme Court decision in 1973 reversed all state laws that had outlawed abortion, thereby establishing a federal mandate in favor of the formerly illegal act. American influence on overseas abortion changed with President Barack Obama’s 2009 termination of a ban on U.S. foreign aid and counsel for abortion services. To the present day, the abortion battle continues in the U.S. court system, including a recent ruling on religious freedom and abortion in California. Over the past 250 years, Americans’ view on abortion has changed drastically. Opinions are strong on each side of the debate. But here’s a jarring fact about abortion that’s hard to ignore: since the infamous Roe vs Wade decision, there have been more than 58 million abortions in the United States. Turning Point’s compassionate and confidential pregnancy services are available to any woman in San Diego County, including those who’ve had an abortion. We believe woman deserve access to clear, accurate information and practical support to make an informed, educated decision. Turning Point provides a safe haven in a non-judgmental space, regardless of past circumstances. For more information about our pregnancy clinic and how we can assist, please call our main office at (858) 397-1970 or text us at (858) 822-9335. Thanks for reading our blog!